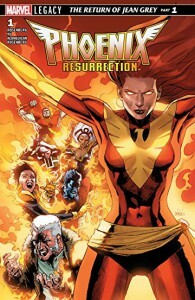 So, the thing is that people keep trying to redo the Phoenix story, and it's always less impressive to me than the original. I also don't like Jean Grey much, but I wanted to see if this was any good, and I got it free via the Marvel Insider program. I'm holding off on more, because I'm not sure I'll like any of the other comics, but I'm also considering the Hulk one. I will not be finishing up with this series, however.